This is one of those recipes that could be classified as "comfort food", because it's a very satisfying older recipe. It was given to me by an older lady in our church, who is a great cook. She makes these yummy meatballs for a lot of different occasions, from church and funeral dinners that we ladies cook for families of members who have passed away, to holiday parties. 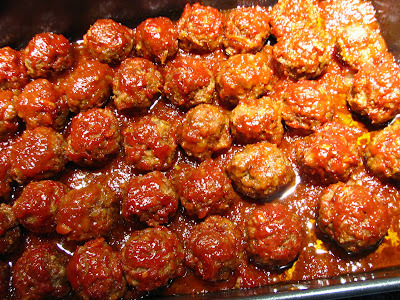 People almost start fights over the last few of these luscious meatballs! The meatballs are tender and covered in a sweet, tangy and easy to make sauce. I made these a bit smaller than a golf ball and had them for dinner with some garlic mashed potatoes. My family loves the tangy sauce! But, these tasty Barbecued Meatballs are wonderful made a bit smaller and served for all kinds of get togethers. Are the guys coming over to watch football? Serve these. Having a small party and want some easy dishes? Make these! They go together quickly. Here's how. Mix all ingredients in a large bowl. Make into balls and place into baking pan. I used a large roasting pan to hold them all. Make sauce. Mix all ingredients and pour over the meatballs. Bake, uncovered, in a preheated 350 degree oven for 45-50 minutes. TIP: Use at least 80-20 lean beef, as fatty beef will yield more grease in the sauce. You can also make these the day before you want to serve them, and then reheat before serving. If you are serving these for a small family, the recipe can easily be halved. Enjoy! Lynda, it's 8 a.m and I am reading your post and am STARVING for these meatballs. Oh my!! lynda, i'm constantly amazed by how so many of your recipes are ones with which i'm intimately familiar. it's as if our families have a shared cookbook. this is a wonderful meal! I agree with Katy! It's about 9am here and I am drooling over these meatballs!!! I'll likely be hosting a holiday get-together or two and these would be perfect! My family loves meatballs!! 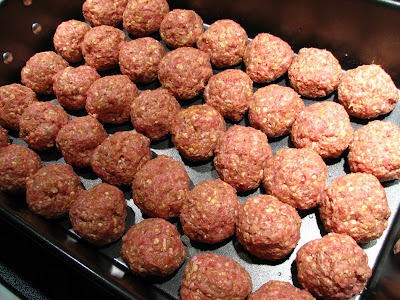 What an inviting drooling mouthwatering meatballs you have made! These look so good! I love the tried and true older recipes. I make some of my mom and grandma recipes for my book club and it's like they are all new again to them! I have not found that perfect meatball recipe. I want to try this one. I like that you baked them. love bbq meatballs but never got around to making them myself because they seemed a pain to make...I think i could manage these fairly well. This is really yummy. Thanks for sharing. WOW! I would love to have this for lunch or dinner,. These would disappear in a heartbeat. I always make my meatballs Italian style - so when my kids go to other places and the barbecue ones are there - they lap it up. Leslie, I've never had them made with grape jelly! Sasha, this is not the recipe I use if making spaghetti and meatballs- it's totally different. I can't use oats. Any suggestions for an alternative. The recipe looks tasty and yes, I would serve these to guests or to family. Either way, I bet, there would be few left. 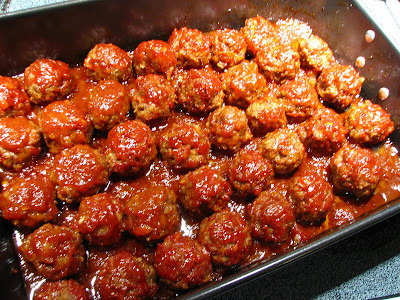 This is my favourite way to make meatballs - in the oven and nice and small. That way they get the perfect crust ratio! Looks great, thanks for sharing the recipe! Those meatballs look delicious. I used oats in my meatloaf and I bet they are terrific in meatballs too. I'll have to try that! Linda that looks sooooo yummy, I must make them for my Xmas Eve appetizer party! These look killer... like they're straight out of a southern restaurant! LOVE the look of these meatballs. can't wait to try them out! Sweet and Savory, bread crumbs can be substituted for the oats. Hope that helps. My grandmother used to make this exact recipe & always with mac and cheese! They are always a hit at any potluck I've made them for. You can also make the meatballs ahead of time and freeze them until ready to use, just make sure you freeze them on wax paper or they'll stick to the pan.